With the holidays fast approaching, you’ve got more than side dishes on the brain. Namely, how the heck are you going to get your place ready for your sister’s family of five? And, oh gosh, are they bringing the new puppy, too? Forget the dog. Focus on the house. A good place to start: the bathroom. 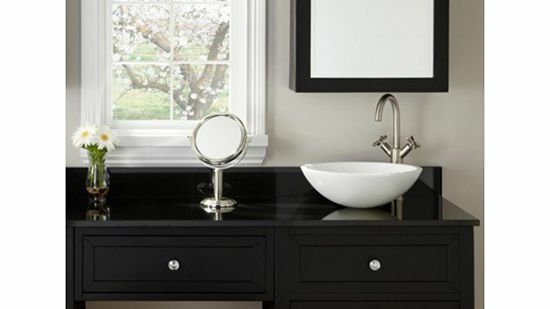 Read on for seven key tips to making your powder room a sanctuary for out-of-towners and a room you’re actually proud to show off. Above all else, make sure the entire bathroom is squeaky clean. 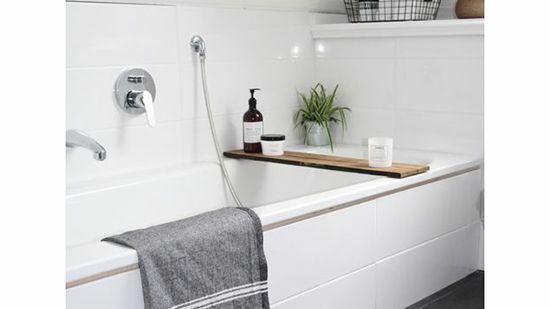 Replace a worn or dated shower curtain, switch out a raggedy bath mat and make certain to leave the tub spotless. Pro tip: Skip the scouring and simply run a Magic Eraser over discolored white surfaces. Then wipe the whole thing down with a paper towel. As a guest, nothing induces panic more than finishing a shower only to discover there's no towel in sight. (Or worse, some tattered old rag.) Do your company a favor and stock up. Nab some oversized plush styles from Ikea (in a different color from your normal set to distinguish), then use the Molger shelving to present everything in clear view. Finally, hang a set of hooks on the wall so each person has their own spot to let their towel dry. Much better than over the door. 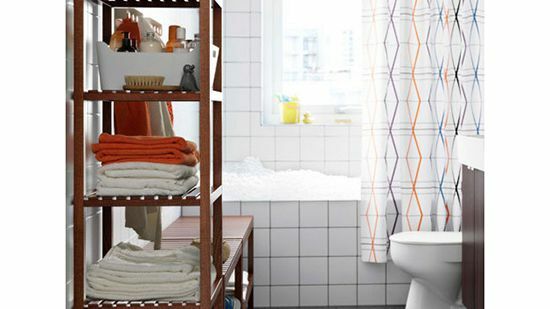 Chances are you share your bathroom with more than one person, so organizing the space can be an overwhelming feat. 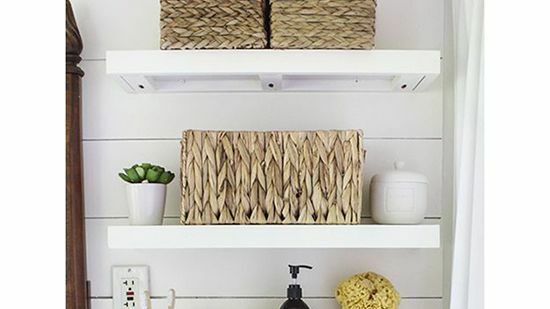 The easiest solution: Buy a few pretty baskets to store all the brushes and beauty products. Pro tip: Conceal everything you don’t want guests to use, but display the items that are fair game. It's your time to shine, pretty bottle of body lotion that smells like peonies. 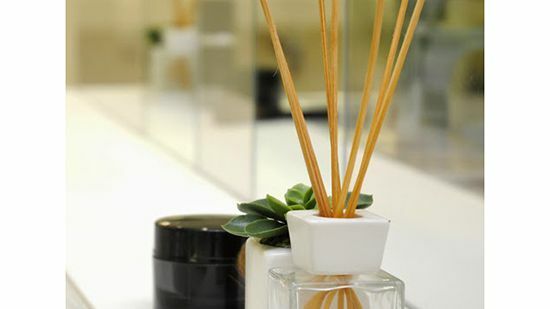 Get yourself an aromatic diffuser. Much prettier than a wall insert and longer lasting, too. 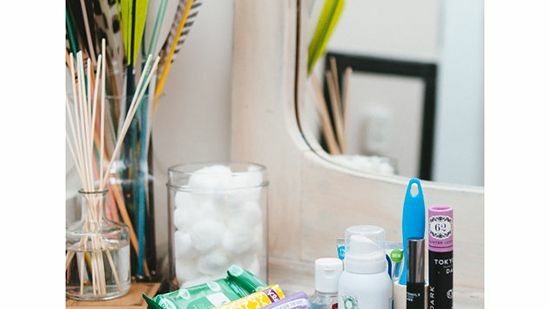 Speaking of products, head to the travel section of your local drugstore and grab miniature versions of everything your guests might have forgotten: disposable razors, deodorant, tampons, travel-sized toothbrushes. Then round up all the sample-size moisturizers, mascaras, perfumes and sunscreens you’ve hoarded from department-store giveaways (or your Birchbox). Stashed in glass jars or on trays, these make for a fun display that lets visitors pick whatever strikes their fancy. An illuminated or magnifying vanity mirror is a thoughtful addition that older visitors with impaired eyesight might really appreciate. Here’s lookin’ at you, Nana. Bath salts, loofahs and bath brushes are items you might expect to find in a high-end hotel or spa. They are also very inexpensive items you can pick up at your local dollar store. 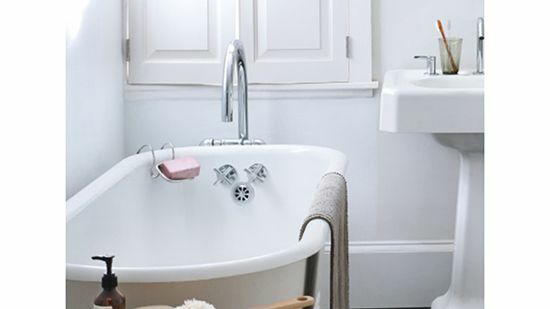 Fill a tub-side bin with an assortment to treat your BFF to a spa-like experience in your closet-sized space.